Saturday 13-July Soaring Report: Fun starts in Tonopah ! In three long days my crew and I drove to Wendover NV, about 2450 miles from Acton. I'd hoped to fly the last leg to Tonopah, but the weather said otherwise. We drove on down to Ely (you've read about the record camps from Ely in Soaring), where we got past the heavy haze and cirrus that were present further north. Ely is only around 150 miles out of Tonopah, so we stopped and I launched the Ventus. 95 degrees on the ground at 6000 feet still gives an OK climb rate but it peters out pretty quick at this density altitude; I found a thermal and did the cool-down-then-retract thing. This country is fantastic and barren. Airports are few and far between, dry lakes are available in only some of the valleys, and the roads are listed as places to land if you really get in trouble (apparently its expected that you can get it down and stopped between the stakes marking the road). Hopefully we'll all avoid such drama this contest. I'm looking forward to the safety briefing as apparently there are more places to land than I could recognize on today's trip. Its really beautiful but extremely rugged, and the clouds are fantastic. Everything is scaled up. The "little" mountains are taller than Mt. Washington, and the big ones are in the 14,000 range still with snow on top. Practice days are Sunday and Monday, then competition starts on Tuesday. Someone said there are ~20 current or former national champions in the line-up here, and I've already seen 10... Should be quite a race. Sunday 14-July Soaring Report: P1 in Tonopah ! Monday 15-July Soaring Report: P2 heats up in Tonopah ! Now its getting serious. Another drag race was called for the second practice day, 187 miles. A bit drier so less chance of storms. Less smoke from fires today, and less cirrus. I even loaded with water today. The start is height-limited to 7000 AGL. You have to stay under this altitude for 2 minutes before start. This is all very well when that's above the thermal tops, or when there's a ripping thermal in the start cylinder and you can start by climbing out the top. Real silly when there's lift that goes 5000 ft higher and no lift in the cylinder. Dive down, mill about, then start, and dive for the next thermal on course. Lower than you want to be by 5000 feet ! Stop whining and get going. First thermal is only 7-8 knots, eventually improving but gets me back up to cloudbase near the start of a monster street. Cruise at 110 knots, pull up in lift. If I can climb straight ahead at better than 7 knots I slow up a lot, otherwise just keep pounding along. Follow the street most of the way to the first turn. SN10 says average 101 mph as I round the first turn, of course the 20 knot tailwind helped. Cross the streets, try to stay high, second turn, ooops, those mountains are starting to fill the canopy again. Should dive at the rocks but I wimped out and circled in 6 knots. Run another street back towards home, diverting away from course to stay under the street. Why ? Because I've managed to line up the sink street when I didn't do that. Wimped out and flew too slow, then overcooked the final glide. Last 25 miles at redline. Arrived too high in lots of traffic, so after finish I pull up and climb out to wait for a less busy time to land. 100.1 MPH ! 300km in 1:50. That sounds fast, but 5 pilots broke 110, and Gary Ittner turned in 122 MPH (that's 300km in 1:30). But its only the second time I've gone over 100 on a task. Gotta go faster to keep up with these guys. Shaking off the cobwebs and trying to remember how to fly the Ventus in 15m (I only ever put the short tips on once before, for Uvalde last year; I really should practice). Perhaps a bungee cord to hold the stick forward would help. Striedeck told me this task could have been completed with no circles, perhaps Gary actually did it. I don't understand how to read the lift lines if you cruise far below the 17k cloudbase though. Tomorrow the real show begins. PS: Gary's trace shows only 13 circles - he didn't do it without any circles, but real close ! John Cochrane did it with no circles but was a bit slower. Today (16-July) we had a serious accident during take-off at Tonopah. A glider ground-looped and hit a motorhome and a pedestrian. The pedestrian was airlifted to Las Vegas and will have brain surgery this evening, and will likely lose an eye. Multiple skull fractures and a broken jaw. Condition is listed as "stable", but perhaps with brain damage. Some older gliders have the release on a long floppy cable. You will NOT be able to grab this in a ground- loop. And, these older gliders are more prone to ground-loop. In such a glider, HOLD ON TO THE RELEASE until you are certain of a safe launch, then LET GO so you cannot accidentally release. PLEASE: practice this. Instructors, please drill it. This was a preventable very serious accident. It was also the SECOND pilot to ground-loop today, and NEITHER pilot pulled the release soon enough. The first ground-loop damaged the glider and he may be out of the contest. Today's flying was marred by a take-off accident. Launch was delayed and the task shortened: 208 miles is a very short task out here. Doug Jacobs won at 111 mph, and more than 40 pilots exceeded 100. My measly 102 was good for only 39th or so. Lets hope we can manage without any more accidents or incidents. When is the lift too good ? What could possibly be wrong with huge lines of 13kt lift ? Perhaps the big blue sparks and microbursts are a clue. Today we launched, but there was no obvious task that would not risk tangling with the big boomers (and PST would be a complete crap-shoot). Task cancelled. I flew along the edge of some of the building storms, plenty of time to play and enjoy the scenery even if no where near enough time for a task. The storms are just stunning to watch from high altitude in the clear air. Just remember to stay away from the sparks. They don't move quickly and don't have a big anvil, so you can fly on the side where the storm is feeding safely - just stay well away from the rain and don't go under the thing where the micro-busts will descend. Quite unlike a really tall fast-moving storm where the shelf is in the hail danger zone. Flew along the edge of a line of storms to the south and found my eyes stinging from the smoke flowing up from the fires near Bishop. Watched the walls of dust flow up into the storms with the sun shining through between these spectacular clouds. Absolutely amazing to see, sorry I didn't have a camera with me. Flew home and put it in the box when it looked like these storms might reach Tonopah. Big storm near the airport resulted in day scrubbed while we were on the grid, followed by a mad rush to get them back in the box. Drying trend makes tomorrow and later days look more promising. Good news: the guy hit by the groundlooping glider has lost an eye, but it looks like he will recover OK. He's in for more surgery, and the plastic surgeon told him he'll certainly look better than he did before the accident. Hopefully to be released from hospital in 5 days or so. Started after 2PM; it was difficult to get a decent start with no thermal convenient to my assigned start cylinder. 2 mile start cylinders are too small for the conditions here. Great first leg, passed a bunch of gliders, had 96 mph average at cloudbase after the first turn. Promptly got in trouble on the second leg and fell behind the pack. Check the pulse oximeter and verify that I am in fact screwing up big-time whilst fully conscious. Made a huge deviation for a 9 knot thermal to finally get back up to a reasonable altitude but now 15 miles off course. Extremely discouraging to hear the first finishers while still 90 miles out, even though I was only 1-2 climbs from final glide. Oh well, somebody has to lose and I'm ready. 76 mph while the winner did 99... Basically dead last for this performance ! Surely better next time. Further reduced moisture didn't prevent beautiful cloud streets developing to the North-East early. We're tasked straight out to the Northern-most turnpoint up past Euraka, then a slight dog-leg home. Should be a fast run up the streets baring any holes. Only 310 miles or so. Started at around 2:15 after a bunch of others had already left. Climbed out the top of the gate, proceeded on course, and stopped to climb at 7 knots in the blue to comfortably reach the clouds over the high ground. Finally got up and ran down the first street. Stayed up in the top 2k below cloudbase and avoided any circling for many miles. At the end of this street, dove at the rocks and sun starting the next one. Climbed at 11 knots, and as I topped it off got to see 30 sailplanes streaming into the bottom. Ran the next street slow enough to stay high and got in front of the others who cruised faster and circled in the cores. This is too good to last, I've passed all the early starters, and I get to the end of the street at cloudbase near Euraka. Its blue and hazy looking 30 miles North to the Bald Mountain mine turnpoint. I dithered and searched under wisps part way. Too low to get out to the turn and back. Picked a bad line and watched all the little planes pass overhead... Its better when there are sailplanes in front marking the lift ! Wasting time getting low near Bald Mountain and then getting out slowly puts me in back of the pack, and the good clouds South are now cycling. Extensive sight-seeing follows. Didn't see the wild Mustang herd one of the guys saw though I may have been at their altitude. Lots of scratching and scraping finally gets me home as the last finisher. 76 mph while the winner did 100... again ! At least I didn't land out as a few did. OK, enough fooling around, time to go fast ! Task is changed and reduced to 240 miles after we launch. The cirrus is moving across the task area, and I wait to start until the sun is shining on the first leg. Start at 2:27 after a bunch of others had already left. Climbed out the top of the gate, proceeded on course, and topped off to 15k at 10 knots under the first cloud on course. Bounced through a 7 knot thermal no doubt really making the circling gliders mad, and hit 11 knots under the next cloud. Keeping the cruise speed down to 100 knots to make it more certain to connect under the next cloud, probably too conservative as the gliders in front of me disappear. Detour past the first turn to stay under a line of clouds but hit no strong cores (5 minutes wasted). Bounced along and get a good look at the over-development, rain, virga, blow-off, etc. in the upcoming task area. Stop and top off at 5 knots to ensure getting around a storm over the high ground between me and the next turnpoint. Detour around the front of the storm to avoid the virga, and find weak lift in the dark in front of the virga. Top off to 16k and glide out to the next run in the dark. Much too conservative. Lots of guys go direct under the messy stuff and pass me. I'm being very cautious to make very sure I don't get low in this area with rain in all directions. 100 knots to the next good cloud, solid climb, blow through some virga to a massive street leading home. Tried to circle once but it sleeted on me so I flew straight. Bounced up to glideslope under the street and ended up on MC 8; good thing as the headwind picked up by 10 knots in the last 20 miles and the reserve was helpful. There were a few straight-ins, which I really don;t want to do out here. The virga is interesting. We saw one cloud collapse with a mass of rain and descending air in the middle of the task area, clearly visible on the second leg. I really don't want to be underneath a cloud when this happens. Its not a real thunderstorm, but the release of water then mixes with the super- dry air, which evaporates the water, and the cooling causes big sink. Yet, while the virga is forming, no huge sink. Local pilots say the rule is through the virga is OK, but never underneath. Wish I understood the mechanism better. In any case, blowing through this stuff is something I'm only going to do with landing sights in easy reach and clear air on the other side. Day 4 starts with severe clear, except for some cloud to the far East. Former MITSA member John Cochrane is in cumulative first place after his win on day 4 - I guess he's getting used to his new plane ! Task A is a 500km dogleg around the task area. I'm last to launch on todays rotation, and while I won't have to spend 1:30 hanging about waiting for the task to open, it would give a chance to relax and cool off before the start. Really windy on the ground - about 25 knots but pretty straight down the runway. As I launch there are gliders relighting. Looks like an interesting day. Its blue except for very isolated wisps and cumulus. Blue days encourage gaggling and when anybody turns everybody turns - very frustrating and inefficient. Still, Task A it is. 25 gliders round the turn at about the same time. Onto the third leg, into wind, over a big mountain range that has to give good thermals but doesn't. Into the next valley, huge area of calm, no workable lift. 25 mile quite glide until the next thermal, glad I got real high before this leg. Some gliders get low on the next range, and its hard to find any decent lift. I just keep bumping along, working into the wind. Almost no markers out ahead, just an occasional wing flash in the distance tells me I'm (surprise) being a slow-poke. The only actual cloud of the day yields some lift near the last turn. 45 mile final glide, nearest place to land on course is - Tonopah. I press out gently looking for the last climb. Work it up to MC 4 with 1500 ft reserve, not enough for this distance and terrain. Press out slowly, bumping up the MC and margin. I see a glider lower dump water and bail out to the North where there's a highway to land on. Don't dump the water on a high wind day until you're landing or you find a thermal ! The view West towards Tonopah is apocalyptic - there's and enormous fire on the Sierra south of Whitney and the sky is black, with what little sun hitting directly in my eyes. Eventually hit strong lift in the shade and press over to warp speed for the last 20 miles. Slow again at around 75, the winner did 86, but the big story is that at least 20 pilots didn't finish the task, including at least 2 of the top 10 (sadly John Cochrane landed out and blew first place). Interesting flight ! Very high wind and difficult conditions for Day 6 on the ground and right near Tonopah. I almost land and a number of others needed relights. Had trouble getting high near the start, almost landed back again, and finally started very late. Bad move - should have started low earlier, though its painful to head into the mountains low. Fast flights started much earlier, even though this was only a 250 mile task. The great streets were decaying when I got there and I had a rough time. Got home very late and very slow. Smoke from the big fire at Sequoia National Park is affecting the Western task area so we're staying East. Stings the eyes on final glide ! What's that burning smell in the cockpit ? Too much Mexican food ? Nope, no Mexican yesterday or this morning. Problem with the electronics ? Not in my glider. Must be the from the lightning off the right wing. Perhaps its time to turn left. From before launch, it was obvious that the sky would explode. Why the *F****$%^@ did they send us on a 340 task directly under the build-ups ? I detour away from the first cell and get a good look at the huge anvil building over the first turn still 50 miles away. The sniffer went out to fly the task ahead of us and reports light hail. Sometimes discretion... As I turn around to fly home, others start calling their crews for the same reason - including many previous national winners. Too bad, I was flying well and running with a couple of the top pilots for the first 70 miles until turning back. The guys I was flying with actually completed the task, but they have a lot more experience with this weather than I. Fly safe - turn around if it doesn't look prudent ! The day started extremely hazy. The short 240 mile task should be quick, but we can't see far enough to be certain about the weather. I start early and have a fast run East towards the first turn. A bit soft right near the turn, the bases aren't so high, and we have to cross back over a mountain range to the area with stronger lift. Some guys fly through the passes and keep going, I stay high and waste 5-10 minutes to keep out of the weeds. Follow the strong bases and bounce along West towards the second turn. Good stuff seems well left of course, and not as strong as it looks. Trying to avoid getting low I take 5kt a few times. Suddenly we're out of the haze into severe clear and blue. A few gliders dive direct towards the turn, but I detour further left to stay under good-looking clouds, and find a thermal that eventually goes to 15k at 9 knots. Follow the wisps downwind into the turn. Past the turn I stop to top off in a 11kt thermal and Karl bounces through. Karl or not, I'll stick with the 11kt. Follow the wisp lines South towards the last turn where there's a huge storm building. Approaching near cloudbase at 15.5k I can see a pass through to sunshine on the other side, tighten the straps and dive through. Altimeter does the cartoon spin in the rain and sink, and finally I hit weak lift near the turn. SN10 shows above glide-slope for home, but that's a joke because I have to go back under the storm. Lots of gliders circling below me but its only 4-5 kts. I press to the other side of the storm which is also working, and get back up to 15.5k - now I have a 10:1 glide on home plus a tail-wind, with a dry lake half way if I don't make it under the storm. What a ride. Altimeter spins down, ear-splitting descent. I hit the gust front on the other side and pull up to gain a little back, then make a normal finish. We scramble to stash YO before the storm reaches the airport. ~20 pilots didn't make it home - arrived too late when the storm was to strong to cross. On the weather channel in the evening there is exactly one storm in all of Nevada, which we had to cross twice ! It was a very unusual long skinny storm caused by a High and Low pinched together, with low-level convergence and high-level divergence enhancing the convection. This is also why both sides of the storm had lift, with the sink in the middle. The weather channel satellite image showed the storm as a line starting in the lee of the Sierra and going all the way into Utah. As usual for this contest, my dithering about made for a slow speed around 73, where the winner did 94. Amazing contest. Winning average speed 100.2 mph. >100k XC miles flown. Winner and 2nd place flying with ILEC SN10 of course (I was hoping for top 5, oh well). Guess I'll have to start practicing if I'm going to fly fast with this crowd ! What a privilege to participate here. Back in Boston, trying to recover from this amazing trip. Including practice and a no-task day: 12 flights, 45:30 air-time, 2500 miles cross-country, no land-outs or relights. Most amazing final glide ever for me: 11 minutes 20 seconds from leaving the lift to the finish line, crossing under a storm on the last day, covering 26.2 miles (138 mph average groundspeed, average vario -8kt and L/D 14.9). The flight log shows more than 24kt down at >200mph groundspeed passing under the storm ! The regular 50 mile glides over unspoiled desert were a bit trying as well, even without storms. Fastest thermal flight ever for me: 101 mph. Gary did a 300km practice day flight at 122mph, and his trace shows only 13 circles. Most bizarre auto accident/incident seen: Picture a set of heavy skid marks down the highway that cross each other as the vehicle swaps ends, and end at a Ryder truck facing the wrong way in the median-side shoulder, with the driver staring at us and holding his head with both hands, and all four tires shredded. We also saw a semi on its side by the highway, a destroyed car that had lost control and bounced off the median barrier a few times on the descent from the Rockies into Denver, and a car and trailer intact and facing the wrong way on the outer shoulder (apparently after the driver fell asleep and crossed the median and opposing traffic). The 5700 miles to drive out and back are probably more of a hazard than the contest, though the new MDX tows the Ventus superbly. Took my loyal crew Justin Oliveira for his first flight in the Duo on Sunday. Justin had his first ride in a 2-32 at Tonopah, but this was his first opportunity to fly. He learned to handle the Duo pretty quickly, including thermalling, and flew more than half of our 3 hour flight around the Sterling area (though we didn't go cross- country, just to Fitchburg and Worcester a few times). Justin is an RC glider pilot, and after all the Duo is just a big model ! Hope you all enjoyed the reports, and Fly safe ! 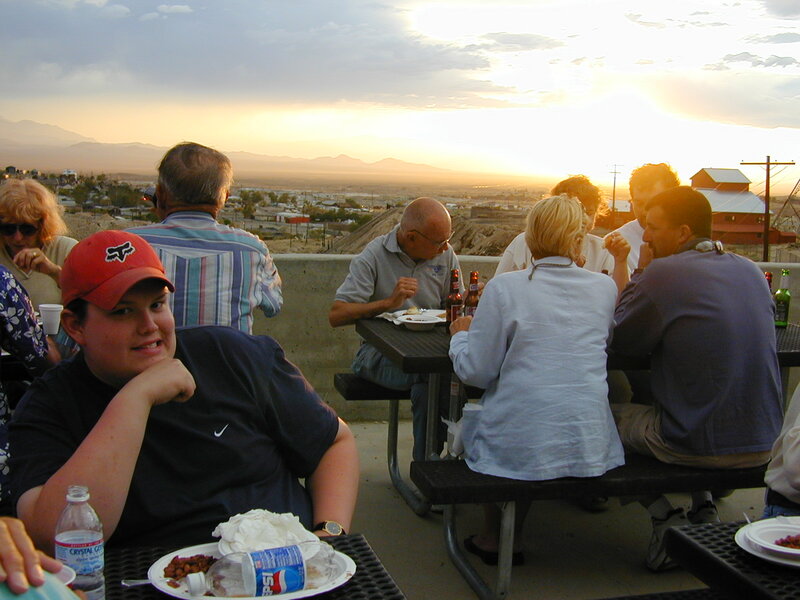 Crew Justin Oliveira at dinner at the Tonopah mining museum. Lots of haze from the California fires in the background.